It's easy to book a hotel room for your next vacation only to have a place to rest at the end of the day. You’ve probably enjoyed your vacations well enough not to include the time spent at your hotel as a highlight when sharing stories. What if you could have a little of both? Instead of your typical cookie-cutter stay, look for a place where the hotel experience is just as important as all the activities you do outside. Castle Rock Resort & Waterpark offers you just that, a place to rest and play. Located in the heart of Branson, Missouri, Castle Rock is a family fun retreat that aims to be more than simply a place to stay. 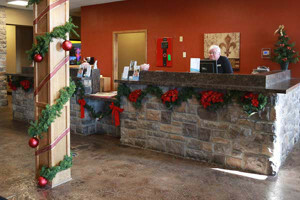 Their staff is dedicated to making your vacation something truly special, and there’s no better time to enjoy all that Castle Rock has to offer than during one of the yearly holidays. Whether you’re planning a trip over Christmas, Easter, or the 4th of July, Castle Rock provides not just comfortable accommodations and modern amenities, but also exciting activities to make your stay memorable. They go all out to ensure you have plenty of fun right onsite with a variety of activities and events. Take Thanksgiving for example; you can join the other guests for a delicious Thanksgiving dinner with all the fixings served at Tower Grill, their onsite restaurant. Memorial Day weekend kicks off the summer with beach music and a fun-filled cookout on the outdoor pool deck. The kids are sure to love an Easter vacation at The Rock, as the staff create a unique, treat and prized-filled egg hunt in the indoor waterpark. The waterpark itself is a great attraction any time of the year; with 30,000 square feet of indoor space and 10,000 square feet of outdoor space, the park is endless entertainment for both the kids and the kids-at-heart. 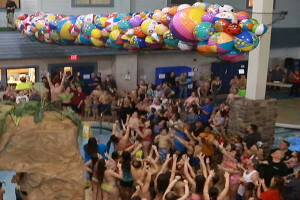 Tipping buckets, spray trees, and waterfalls will delight young swimmers, while those seeking action set their sights on the twists and turns of the three story thrill slides. It wouldn't be complete without the ultimate, fan favorite, "crazy" river. With multiple indoor and outdoor kiddie pools also available you’re assured to never have a dull moment. If you’re interested in spending the winter holidays at Castle Rock, you’re in for a magical treat. You’ll get to see the hotel decked out in Christmas décor and find yourself singing along to the festive Christmas music throughout your stay. They offer a Christmas package that includes a drive thru Christmas Lights Tour! Ring in the New Year with a midnight beach ball drop while attending their annual New Year’s Eve party. They’re rockin from 9pm to 1am complete with DJ, karaoke, party favors, food buffet, photo booth, prizes and more! No matter what time of the year you choose to visit, Castle Rock’s friendly staff, comfortable lodging, and assortment of amenities make your stay as relaxed and convenient as possible. So don’t waste any time! Celebrate the holidays with Castle Rock and discover what it’s like to have a full hotel experience, one that you’re sure to remember for years to come.